Codex on the Flight of Birds is a relatively short codex of circa 1505 by Leonardo da Vinci. It comprises 18 folios and measures 21 × 15 centimetres. Now held at the Biblioteca Reale in Turin, Italy, the codex begins with an examination of the flight behavior of birds and proposes mechanisms for flight by machines. Da Vinci constructed a number of these machines, and attempted to launch them from a hill near Florence. However, his efforts failed. 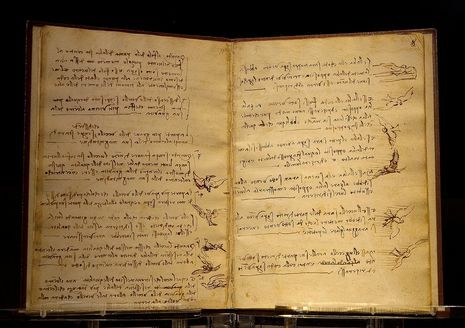 In the codex, Da Vinci notes for the first time that the center of gravity of a flying bird does not coincide with its center of pressure. 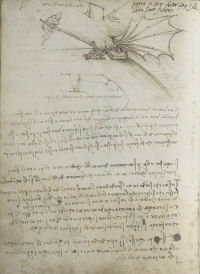 Leonardo’s greatest and most famous ambition was to fly. Realising that man lacked the required muscular power to lift a flying machine into the air, beating wings disappeared from his designs for flying machines. Instead, he began to consider the possibility of sail flight or gliding. He began to study the flight of birds intensely in order to understand how they exploited the air currents and wind, and recorded his observations in the so-called Codex on the Flight of Birds (in Leonardo’s own words Sul Volo degli Uccelli) .